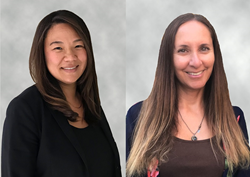 “We are pleased to welcome both Liz and Lilly to our expanding Southern California environmental planning and sciences team of professionals,” said Jack Allen, HNTB national environmental planning practice leader and vice president. HNTB Corporation has added two environmental planning professionals in transportation to its growing environmental practice in the West Division. Elisabeth “Liz” Suh joined the firm as director of environmental planning (highway) and Lilly Acuña serves as environmental planner. Both are based in the firm’s downtown Los Angeles office. Liz Suh brings more than 17 years of experience developing, managing and delivering the environmental aspects of various transportation studies for the most complex highway projects in Southern California. Her responsibilities include work planning, fee estimating, quality management and control, project reviews, resource allocation and staff management, as well as project management expertise to deliver key projects. Prior to joining HNTB, Suh spent 12 years at Caltrans District 7 where she worked on the I-405 Sepulveda Pass HOV Widening EIR/EIS and environmental compliance during construction. Her recent projects include the SR-710 North EIR/EIS and District 7 Environmental On-Call. Suh holds a bachelor’s degree from the University of California, Berkeley, in geography and city and regional planning. Lilly Acuña has more than 12 years of transportation experience, including environmental planning, project coordination and community outreach support. Acuña provides environmental support for the firm’s highway, bridge and transit projects. She also is responsible for establishing community initiatives in the Los Angeles office that will promote employee engagement within the region. Acuña previously worked on the SR-710 North EIR/EIS, working closely with the Los Angeles County Metropolitan Transportation Authority and Caltrans District 7 to meet aggressive timelines to circulate the Draft EIR/EIS for a complex and controversial project in just over two years, and helped navigate the multi-agency review process for the Final EIR/EIS. Acuña attended California Polytechnic State University, San Luis Obispo, and earned her bachelor’s degree in business administration. HNTB is a leading infrastructure solutions firm in the U.S., with roots in Southern California since beginning work on Pasadena’s Arroyo Seco Bridge in 1914, the firm’s first year of operation. HNTB has since been involved in some of the region’s most high-profile, complex infrastructure programs that are reshaping the West, including the Interstate 405 Sepulveda Pass Improvements project, the Tom Bradley International Terminal Expansion for Los Angeles World Airports; and the “Green Build” expansion at San Diego International Airport.